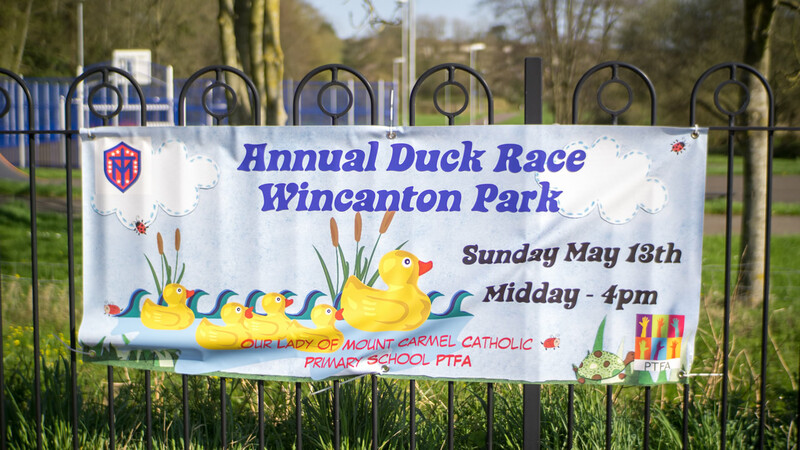 Our Lady of Mount Carmel Catholic Primary School PTFA is hosting their annual Duck Race on Sunday 13th May 2018 from 12pm – 4.00pm at Cale Park in Wincanton. The exciting duck race will be held on the River Cale with prizes for the winners. Expect an afternoon of fun for all the family. There'll be a large bouncy castle, inflatables, a wide range of stalls, merry-go-round and children’s crafts and activities. A licensed bar, BBQ, Freak Shakes, hot drinks and sweet treats. There'll also be a few surprise well-known guests. There will be six races, each involving 50 ducks, and then a final. Prizes will be awarded to the winners of each race. Ducks can be bought at the school prior to the event or on the day. The display arena will host shows from Pitcombe Rock Falconry, Our Lady’s Country Dancers, Starlight Majorettes and Pompom Troupe and Just Dance. This event is the next in a series being held to raise money for laptops and school hook days that are crucial for the children of the school. The hook days provide a unique learning experience supporting the current topic that is being covered within the daily lessons. It is important for children to not only learn a specific subject within a classroom but also to gain first-hand experience of that subject in the field. Often, doing is learning; further embedding the knowledge gained within the classroom. Without the money raised, the hook days would be difficult to organise, with parents often being required to pay more money towards the cost of the trip. Alternatively, trips simply would not take place, losing this precious learning experience. Technology is our future therefore it is essential that our children are equipped with the necessary computer skills. Skills that for most of us have become part of everyday life, from online banking to applying for jobs, to social media. Our Lady of Mount Catholic Carmel Primary School is keen to continue to embrace technology and provide computer skills to set their children up for their future. In order to achieve more cohesive IT lessons they are in need of additional laptops with updated software. Our Lady of Mount Carmel Catholic Primary School PTFA is eager to increase the important funds needed to purchase the laptops and hook days and hopes that all our parents, grandparents, and friends of the school, as well as local businesses will support us. Contact Marie Stewart Our Lady of Mount Carmel Catholic Primary School PTFA Chairman for more information on 07976 051354 or .